If your child is in Year 6 and was born between 1 September 2007 and 31 August 2008 (inclusive), they must attend a secondary school in September 2019 unless you decide to educate your child at home. The information contained in the secondary admission booklet and on this website is intended to help you in the initial stages of the application to secondary school process. We strongly advise you to read through the information in this booklet before applying for a school place. You can find your nearest secondary school on our school finder webpages. Applications received after the closing date will be dealt with as late applications and will be considered after 1 March 2019. We provide impartial advice, support and information about choosing a secondary school. Remember there is no substitute for visiting any school that you are considering. We suggest that you visit potential schools before making your preferences as there are many things to consider such as travel arrangements. The closing date for all applications is 31 October 2018. If you miss this date your application will be ‘late’ and you will reduce the likelihood of receiving an offer at one of your preferred schools. 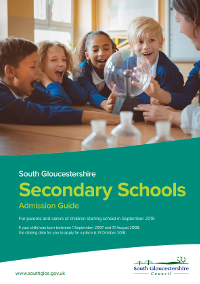 Offer of a secondary school place made to parents/carers resident in South Gloucestershire will be on 1 March 2019. Parents/carers must reply to offers made by 15 March 2019.